Sometime after his 3rd birthday we decided that The Secret Room would be his 4th birthday present. This meant getting it fixed up. We had our contractor, Steve, come work on it only during the hours that The Boy was at school. And I started talking excitedly about the project to friends and family. A lot of people were in on the secret. (Luckily, we never blew it before the big reveal on his birthday last month.) Steve ripped out the linoleum and wood paneling, then installed new drywall, wood laminate flooring, base molding and put on a fresh coat of paint. I decided to have him paint an accent wall, using a darker shade of the paint in The Boy's bedroom. Steve also installed a proper light fixture. Then I got to work on decorating the space. Most of it was from Ikea or found around the house. 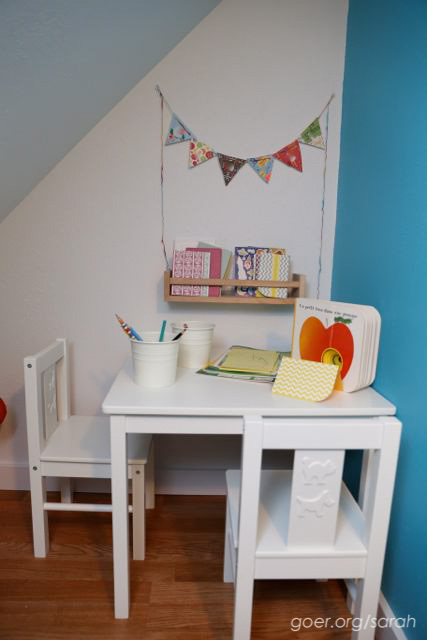 I got a white Kritter table and two chairs to provide space for drawing, writing and small craft projects. I added a Bekvam spice rack, also from Ikea, on the wall to hold writing and drawing supplies, including note cards and stickers. The pencil holders on the table are two plant pots from Ikea, the same kind I use at the kids art table downstairs. I snagged the name banner that The Boy made at school to add to the wall. It was a hit! There was a treasure hunt around the house with clues on The Boy's birthday morning for him to find his gift. His last clue was to push on the dresser to slide it over. He needed a bit of help since it was “really, really hard.” Then he could see the door. “What do you see?” I asked. “That door there,” he declared. Here he is enjoying his birthday bedtime story with dad in the secret treasure room. Posted in Kid Stuff. 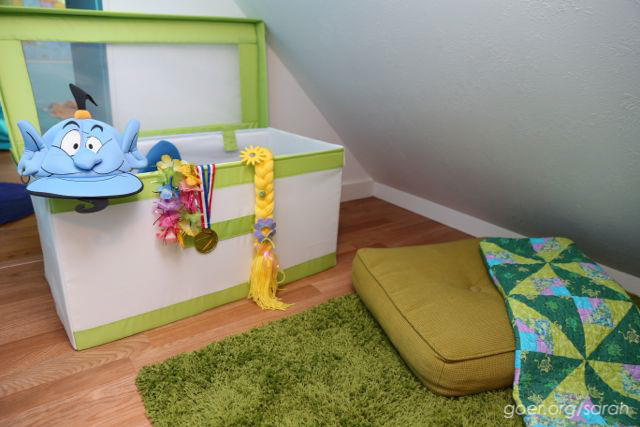 Tags: home decor, remodel, secret room on August 5, 2014 by sarah. 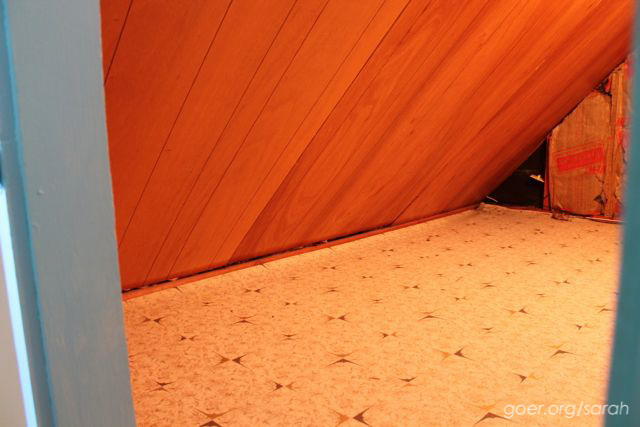 I've heard about this room for years but I hadn't seen "before" pics before. Awesome transformation. Love his treasure room! Thanks! Sorry it took so long to share pictures. Just awesome! Thanks for sharing the before and after Picts. What a lucky boy with very clever parents. Thanks, Sherry! It was very fun to put together. Oh Sarah just think of the fun he will have in this little room. What a wonderful project. It turned out great! I am remarkably impressed! We had thought about doing something similar (though not with the added "in her room" awesomeness), but we just haven't managed to make it practical. This is just delightful. Oh my goodness this is so cute! What an awesome present! I have a four year-old and I know he would just love this (along with my four other kids). Thank you! He's having a lot of fun sharing it with everyone who comes to visit. When I was a small child, my parents did birthday hunts for me. And I loved them, and they had all sorts of wonderful treasures and presents and fun. This blows all that away. You've got a very lucky kid there. 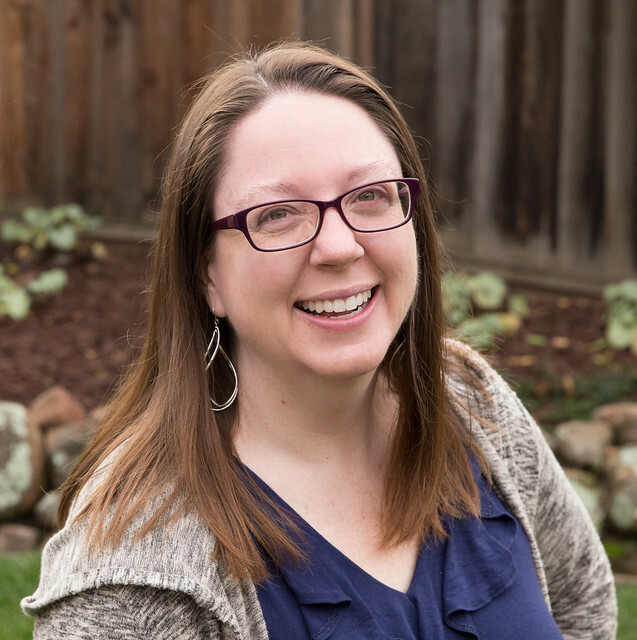 My parents started doing it after I fell in love with the Eric Carle book "The Secret Birthday Message", which is a great book for kids who are ALMOST reading, but not quite. It's got words, but shapes are just as important, so I loved "reading" it with my parents' help. 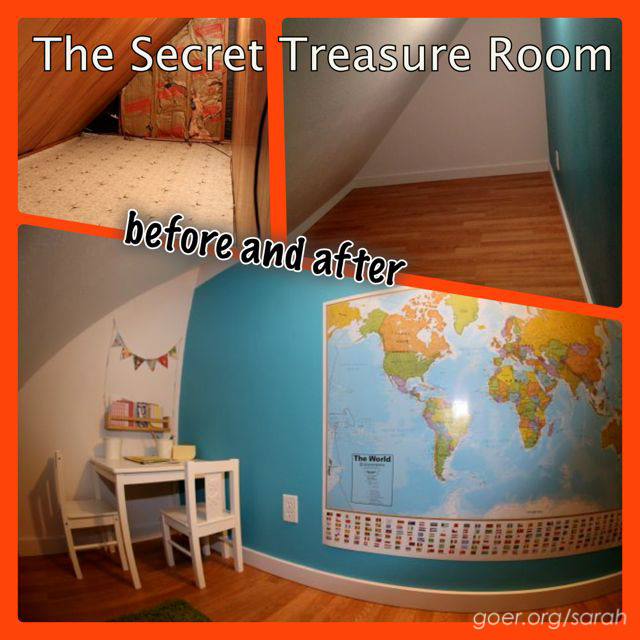 It seems like it would SO AMAZINGLY COOL to read "The Secret Birthday Message" with your parents while in one's Secret Birthday Treasure Room. Not an object to use, put a place to be! Brilliant! There's a similar crawl space in the attic attached to my daughters' room. They're currently 10mos and 2- that gives me a year or two to pull this off (step one, get husband on board)! And to work on it, ours is a lot rougher right now. Thank you, Andey. Best wishes on your project. I'm sure the girls would love it! I had one of these when I was growing up, except my parents never finished it and I had to climb down into it. It was so cool! What a beautiful gift for your son. Thank you, Jess. It's been really fun to hear everyone's stories of their fun spaces. What a great idea. Such a beautiful room. I thought that banner looked familiar! I can just imagine the look on his face when he made the discovery. Precious. I know parents end up with shoe boxes filled with melty bead treasures. I know one parent used them as birthday present toppers-tied them on gifts with ribbon. BTW I am going to snag the spice rack idea for our writing desk, I will be heading to IKEA this week to purchase melty beads and I'm going to grab one of those spice racks also. Awesome space! Love it. Did the table and chairs come from IKEA, as well? Yes, they did. We have some of the chairs at our art table downstairs and they are great. Easy for the kids to use, and stable enough for an adult to sit on if needed. This is one of the coolest things I've ever seen done in a house. Very lucky little guy. What an amazing idea! He's going to make a lot of memories in that room, and likely going to create some friendships over it too. Curious though, how's the ventilation in the room when the door is shut? Thanks! He really loves to entertain in it. Last week 5 kids were drawing pictures and writing messages and they had a mailbox set up to deliver them to us in the other room. The rule is that if anyone is inside the room then the door stays open. 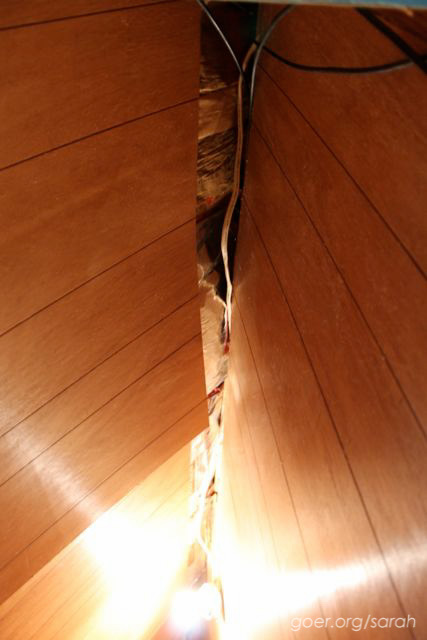 Though if it were pulled all the way closed there's a pretty sizable gap at the bottom -- it's nowhere near airtight. Just hopped over form Apartment therapy, this is so cute! We are about to move into our first home (that we own instead of rent) and I would love to be able to do this, but I'm pretty sure we don't have a side attic space. My parents could have done this though as they have it on both bedrooms! would have been so cool as a kid, your little one is so lucky! Thank you, Chantele. I've thought a lot about creating fun spaces for kids. 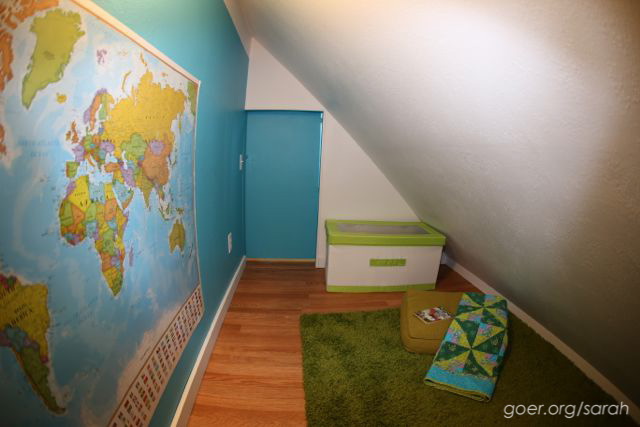 For an older child I think a loft bed with a decorated space underneath would be fun. 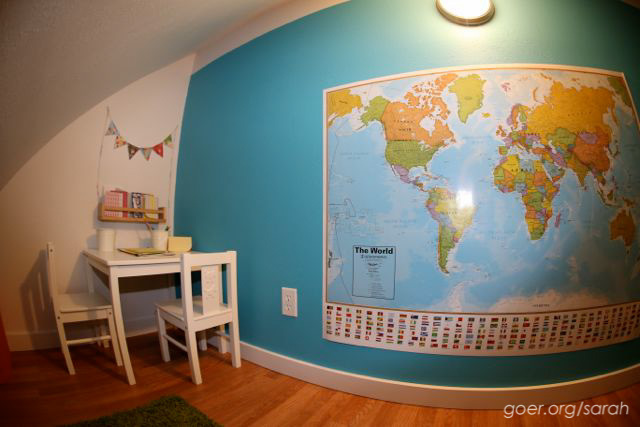 It's all about considering a kids interests to create a personalized space. That room is AMAZING! **I** would love it, and my girls sure would, too—even now at 11 & 13!! 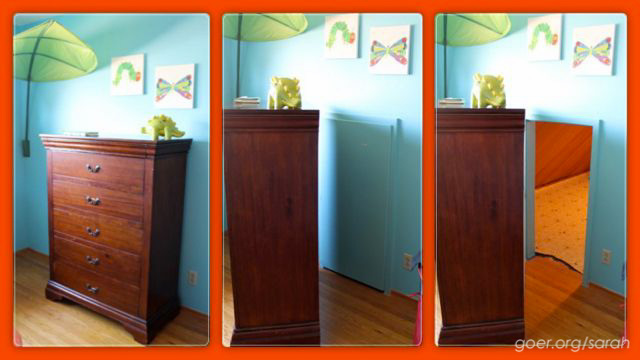 One question--how do you keep your son safe from the dresser if it's not secured to the wall? Is it still hiding the entrance? (We just moved & I spent this week securing furniture to keep our best friends' 3-year-old safe while often here). Just asking b/c another friend's niece died when shelves fell over on her. I'm so sorry to hear about your friend's niece. His dresser hid the entrance for two years. He moved it (with furniture sliders and help from dad) on his birthday to find his gift. Now it's safely out of the way of the door. I too have spent a lot of time securing furniture to walls. We live in earthquake country, so it's necessary here. Your kids are old enough that maybe they could brainstorm with you about how they could share the space. What are their interests? Reading area? Open floor space for legos or other activities? A table that could be utilized for art, writing, crafts, games, puzzles, etc? Pinterest is full of fun ideas for kids. Good luck! I'd love to see pictures when you get it done! 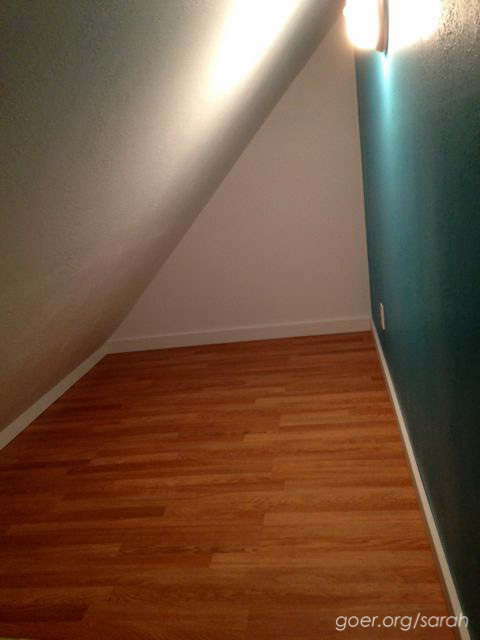 My youngest's room has 2 side attics. I don't think they are as big/tall as this but it is a neat idea to think about. 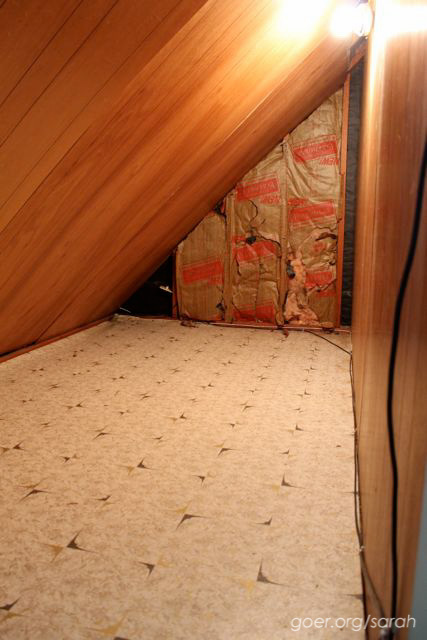 Question though - since hers are attics to you have suggestions on how to keep it cool in summer and warm in winter? As for it being warm in the summer it hasn't been too bad. I've monitored it in case we need to take a break from using it if it's too hot. His bedroom gets a decent breeze through the window and has a ceiling fan, so I think that has helped. And the rule is that if anyone is inside the secret room then we keep the door open. For winter, I imagine it'll be cooler than surrounding rooms, so we might be wearing more sweatshirts and quilts while reading and playing in there. :-) I'd love to see pictures if you fix up your space(s)! That is awesome! I always wanted a secret room. Nice work! I would screw wheels on thr bottom of the dresser and screw the dresser to the door . That way he can just pull the dresser and use that as the door and make it more secret. That's a fun idea. Thanks for visiting! Hi Andrea! Nice to "meet" you! I love your post and all your fun spaces in your house. The Secret Room is a big hit on the tour here. :-) Thanks for visiting my blog. I saw this post and though it was the cutest idea! Then we bought a house and found a similar room and I want to do something like that for my girls! I loveee the idea! Thank you for sharing!! Thanks, Juliana. We're really enjoying it. Good luck with your project. WOW. That's one awesome renovation and one lucky kid!! !